Hi all! 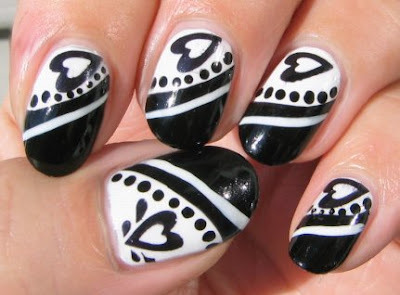 This is my entry for last weeks "Black and White" Fab Nail Art challenge. The FNA Challenge is being hosted by the ladies at Fab ur Nails and Art of Nail . Thank you gals for hosting these neat challenges! I painted two coats of Claire's Snow Ball, then used my Kiss black striper polish to draw a curving diagonal across each nail. I filled in the tips with Claire's Black Hole. I then used my Kiss white nail striper for the white diagonal stripe. I used Konad special polish in Black Pearl and BM IP #09 for the heart image (using a Q-tip with acetone to remove the splashes for all nails but my thumb. I used Claire's Black Hole and my embossing stylus to make the dots. Top coat and voila! 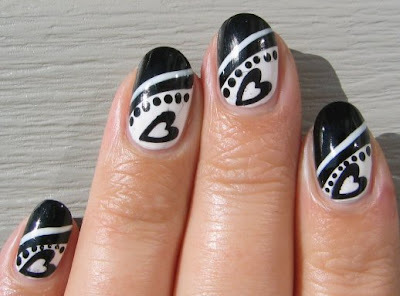 My "Black Black Heart" mani. Oh. This must mean I'm diggin' it. It has a pet name already! I experienced Shrinkage with my Seche Vite this time around, so today I'll be switching up my naildo. I picked up some cool new Kiss Art colors for striping so maybe I'll play with those! I REALLY really love this one JQ, it's SO cool! 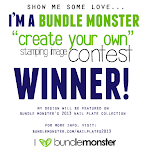 I wish I had that kind of talent - I love your designs and ideas. really like the way you left the splash on the nail! wish I could get my lines as perfect as yours! and what is the Shrinkage? I am not a Seche Vite fan.. try Poshe or Sally Hansen Insta-Dri if you haven't already I like them a lot better. Nicole: Oh Thank you Nicole! Your blog is one of my favorites to visit. I check in every day! I sure appreciate the compliment. Domestic Goddess: Thank you so much! I would have let the splash on all the nails but I didn't have enough room. well the evening I did this manicure the tips were fines, but when I woke up in the morning I had a little white sliver of my nail tip showing, as though as the Seche set it dragged the polish back with it. I read a neat entry about Seche Vite on All You Desire's Blog. Here is the link. Susie1955: :) Thank you much! I will look into Posh for sure, and I was using Sally Hansen Quick Dry, but I got a bottle with a really bum brush, and also was noticing a lot of trouble when it made my stamp art smear, but it's my next best thing. :) I've actually tried very few top coats so far. Really great job! Looks very classy! I'm in love with this one. 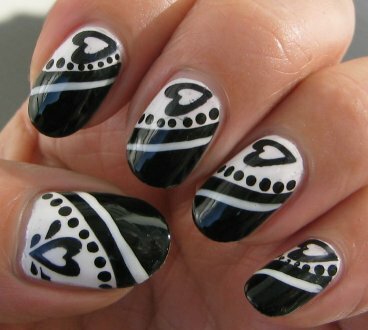 Enough so that I want this on my nails. Thankya rmcandlelight! Yay I broke 50! Happy dance!